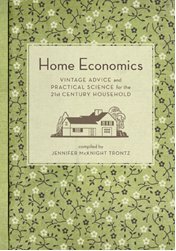 The following is an extract taken from a new publication called "Home Economics" which reintroduces readers to all of our Grandparents thrifty tips, advice, delicious recipes, money-saving, time-saving techniques. This is the art – and, more importantly – the science of housekeeping, more relevant then ever before in these cash-strapped times. Use lukewarm water and make a rich suds of any neutral soap. Wash only one piece at a time. Do not soak, boil or rub woolen material. Punch and knead the garment in the suds until it is clean. If one soapy washing is not enough, use a second one. Wring out the soapy water by squeezing. Rinse the garment thoroughly through two or three waters of the same lukewarm temperature. Squeeze the water out and shake the garment. Hang in a warm, shady place and let dry thoroughly. While drying, the garment should be shaped by pulling and stretching. When partly dry, the garment should be turned. Lay a damp cloth over the garment and press with a hot iron. I would just like to point out that these days it is not recommended to hang wet woollen garments as the weight can stretch them out of shape. It is thought preferable to lay them flat on a white towel or, alternatively, they can be rolled up in a soft, clean, white towel until most of the moisture has been extracted. This publication maybe small but it contains a wealth of useful information: a practical guide to keeping house and home together on a budget and making the most of what you have without spending a fortune. The charming, practical advice speaks to each and every home maker and combined with vintage illustrations, ‘how-to’ diagrams, and clear, precise instructions it would make a wonderful gift for anyone involved in running a home.